The renovation of Mid County Park, including the Kidsburg playground, is well underway. Significant rains and modifications to the soils have delayed the project; however, much progress has been made. The old Kidsburg structure was removed, and contractors have prepared the site and installation of the new playground structure has begun. 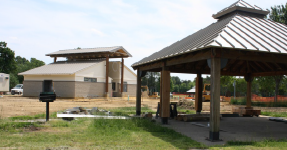 The new Park Office (pictured background) building is near completion and will include improved restroom facilities, a vending area, two staff offices and a fee-based community meeting room. Both picnic shelters (foreground) received new roofing, and one shelter was enlarged due to the removal of an old concession room. Improvements to the front parking lot are scheduled to take place in June. The basketball, tennis and volleyball courts as well as the walking trail remain open during daylight hours with parking available in the back parking lot. The park is expected to open in its entirety in mid-July. During the Kidsburg renovations, please enjoy the playgrounds located within our other County parks and facilities—Chickahominy Riverfront Park, Forest Glen Park, Ironbound Park, Little Creek Reservoir Park, Upper County Park, the James City County Recreation Center, the James River Community Center and the Warhill Sports Complex. In addition to these sites, all Williamsburg-James City County Public Schools playgrounds are open to the community during after school hours. The old Kidsburg, a community-built playground, opened in 1994 and no longer meets ADA guidelines or current standards for public-use playgrounds. The new playground will be fully ADA and safety compliant, universal and barrier free.